When working near busy roads or machines, it can be crucial that you are visible to your surroundings. At MASCOT, we have a wide selection of hi-vis gilets of fluorescent materials. With MASCOT’s hi-vis gilets, you are guaranteed to be visible both in daylight and in the dark. The gilets are certified according to EN ISO 20471, which gives you maximum visibility and safety. MASCOT offers hi-vis gilets with many different features and details so you can easily find a gilet that fits your working needs. MASCOT's hi-vis gilets are available both as traffic vests, thermal gilets, winter gilets and tool vests. Therefore, you are guaranteed to find a gilet in the assortment to suits your particular work situation. Hi-vis gilets from MASCOT are available in different fluorescent colours and sizes. You will find the hi-vis gilets in the fluorescent colours yellow, orange and red. The traffic vests are large in size since you should be able to wear them on top of other workwear from MASCOT. Hi-vis gilets from MASCOT have several practical features including practical inner pockets or tool pockets for storage of your tools. 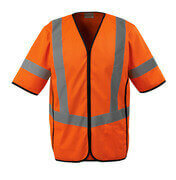 Hi-vis gilets from MASCOT feature visible reflectors, both vertical and chevrone. A number of gilets are treated with Teflon® on the surface. Teflon® provides a dirt repellent surface so you remain visible to your surroundings for a longer period of time. Several of MASCOT’s hi-vis gilets are both breathable, windproof and water-repellent in order to provide you with high comfort and the possibility of using the gilets in changing weather. By using MASCOT's simple letter system, you can easily find out how to achieve a higher certified safety class for your safety workwear by combining the gilet with other products. This is essential when your work requires maximum security and visibility.